CJ and Andre from Masters and Munn visited the museum recently and created beautiful moulds and casts taken from some of the museum’s natural history specimens. 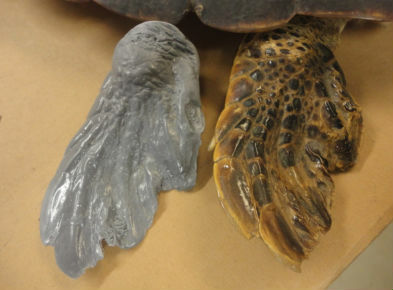 The turtle and gharial (a type of small crocodile) both had moulds and impressions taken, and the casts are to be used by the World Wildlife Fund as a tactile exhibit for visually impaired visitors to touch endangered species. Their previous works have included the moulding of a baby elephant. Children who have been blind from birth were then able to touch the moulding. From this they were able to get a real sense of the scale of the animal as well as what they feel like – a truly wonderous gift! It’s great to see the museum’s collections being opened up and put to new and interesting uses!